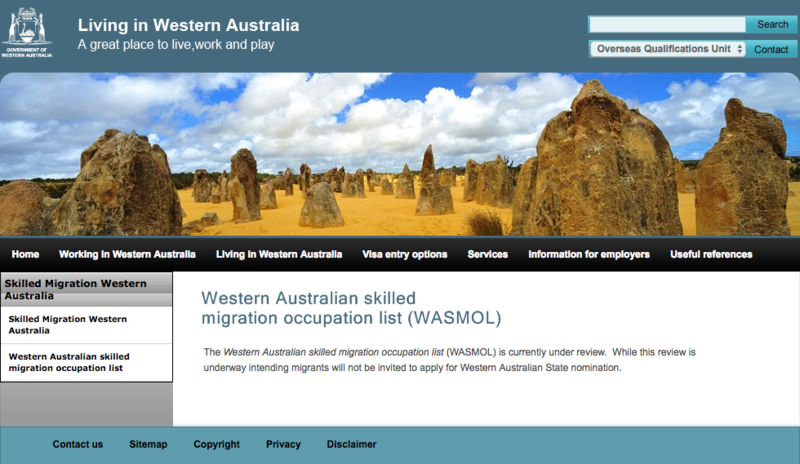 Western Australia has stopped processing state nominations and regional certifications pending a review of the state migration programme. The affected visa subclasses are the skilled state nominated 190 visa, the regional provisional 489 visa and the Regional permanent employer sponsored 187 visa. This move comes after the state election at the weekend which saw a new state government elected. They moved quickly to suspend processing of state and regional nominations on the first day of business after the election. There is no information yet as to how long the review will take and whether processing will recommence any time soon. Potential applicants will now need to either ensure they have enough points and an occupation on the Skilled Occupation List to qualify for the independent skilled migration subclass 189 visa or look to the subclass 186 for a permanent employer sponsored visa, which has fewer concessions than the Regional subclass 187 visa. Let us know if you have been affected by these changes and we can help you plan an alternative visa pathway. If you already have a Registered Migration Agent working on one of the above visas for you, get in contact with them to see if your nomination or regional certification is currently in process at the WA state migration department as you may need another plan!